The rain didn't stop us. Umbrellas in hand, we made sure we didn't miss this weekend's Open House Chicago. Though we didn't quite make it to all 150 available buildings, but we were excited for the chance to visit quite a few. We spent Saturday visiting the interiors of several of the Prarie Avenue Mansions in our neighborhood. All those servants quarters made our afternoon feel like an American version of Downton Abbey. Then, on Sunday, we headed North. 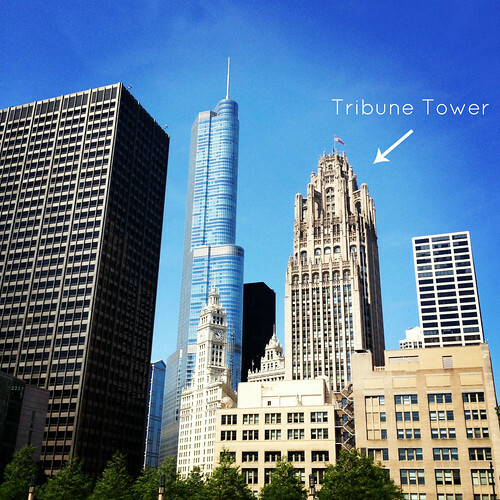 First stop: Tribune Tower. 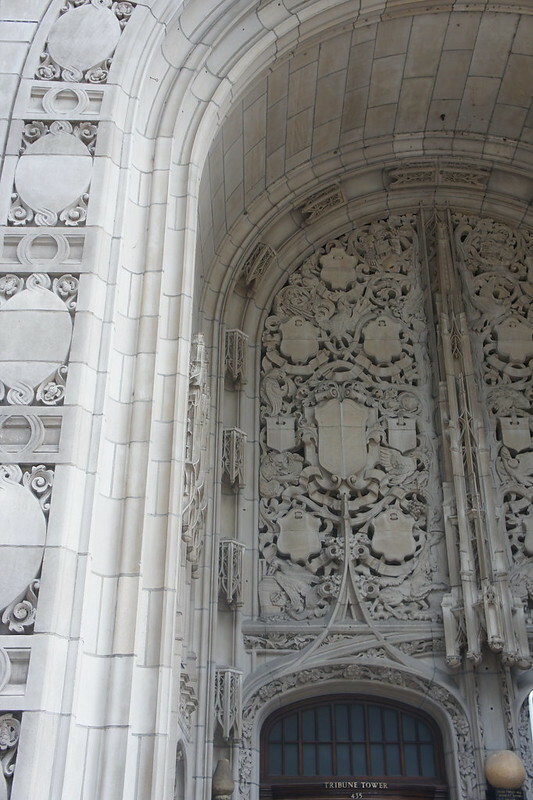 The neo-gothic style was chosen because it is most often associated with cathedrals. This building was meant to be not only the most beautiful and distinctive office building in the world, but it was also intended to pay homage and exhibit reverence to freedom of speech and freedom of the press. Colonel Robert R. McCormick and his cousin Joseph M. Patterson were co-editors and co-publishers at the time of the buildings' construction. Each had an office on the 24th floor, each had a beautiful view, and each had a hidden escape hatch. If I hadn't seen it myself, I wouldn't believe the story. The hatch in what was once Patterson's office still exists. In the above pictures, you'll notice a "closet" that is nearly invisible when the door is closed. 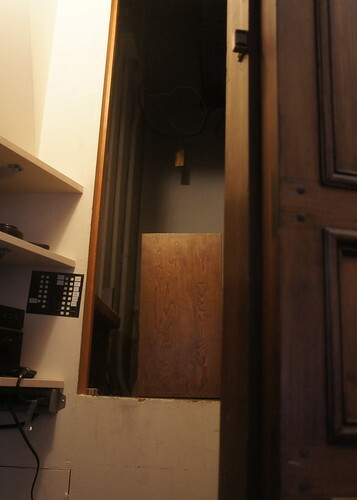 Inside the "closet" you'll find a super secret door that leads to a narrow stair case ending at the no-longer-open-to-the-public observation deck. But the escape hatches weren't the only design eccentricities. In the Colonel's office there are four doors and only one door knob. Legend has it, the Colonel wanted to make sure when you left a meeting you were leaving on his terms. Apparently there was a button on his desk that unlatched one of the doors and allowed people to enter and exit through it. And I thought I was a control freak! But he was a control freak with a killer view. "Damn it feels good to be a gangsta." All eccentricities aside, the Colonel was responsible for commissioning an iconic Chicago skyscraper. And he was proud of it. He made no secret of the fact that the building cost $8.5 million. (...again, in 1920s $$$!!!) At the time of it's completion, only the Eiffel Tower in Paris and three skyscrapers in New York City exceeded its overall height. 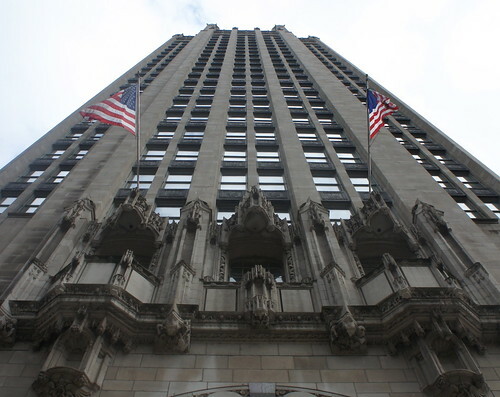 Eighty something years later, it remains one of the quintessential Chicago buildings. So, who/what do you think these cousins were needing to "escape?" 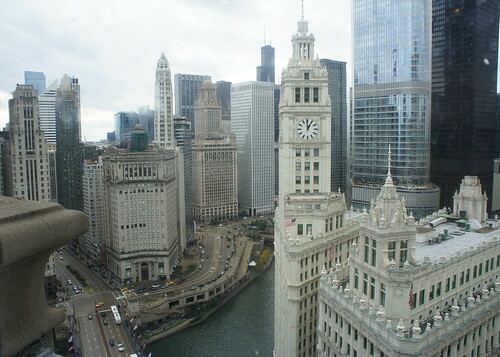 Tune in later this week for more Open House Chicago Fun.